Drawing organic molecules is essential to getting a great grade in organic chemistry. Often times, professors will deduct many points from students who understand the material just because their drawing are horrible! Unfortunately, this class can be as much about art as the science but remember it is important not just to understand but to communicate that you understand! Only lots of practice and these tips from StudyOrgo will guarantee you will get all the preparation you need to ace the next exam. Sign up for a membership with StudyOrgo today to get help with all of your organic chemistry questions! The simplest drawings in organic chemistry are line drawings. General chemistry often indicated each element bond in a molecule. Organic chemists use complicated molecules and time is precious. Therefore, a quick way to draw hydrocarbons was necessary. 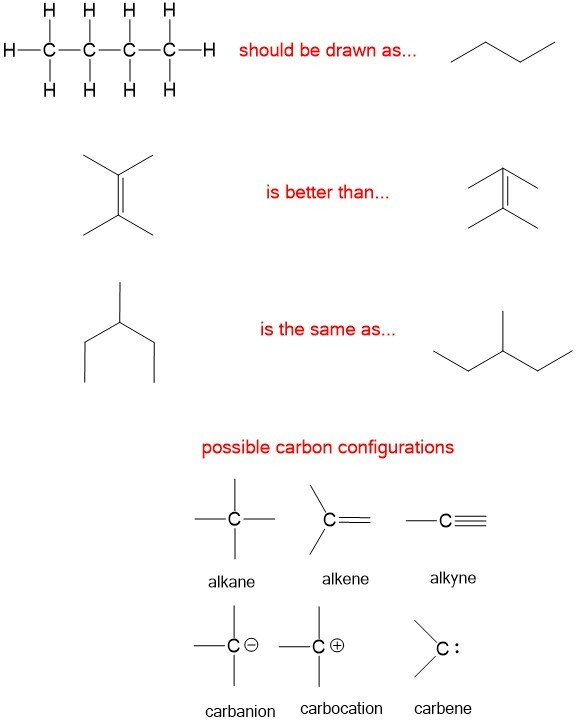 There are a few rules to help you draw the appropriate structures in organic chemistry. Draw carbons in a zigzag pattern, points are carbon atoms and lines are bonds. All other atoms bonded to carbon, unless otherwise stated, are hydrogens. Draw all bonds as far away as possible. Drawing single bond carbons in any direction is equivalent. Never, never, never draw more than 4 bonds to carbon!!! Dash and wedge: One piece of information that is lost in the line drawing of molecules is the three-dimensional arrangement of the substituents around carbon atoms. This becomes very important when dealing with stereocenters, which will have two possible enantiomers. To describe this arrangement, chemists use the dash and wedge model. Imagining the paper (or computer monitor in this case) is the mirror plane, the dash indicates a bond below the plane and the wedge indicates a bond above the plane. Looking at the example below, we see that the stereochemistry of 1-chloroethanol is ambiguous when drawn as a line structure. Drawn as a dash and wedge, it becomes very clear that the stereoconformation shown is R-1-chloroethanol. Fischer projection: For acyclic molecules, especially those with many substituents, chemists will use the Fisher projection to make drawing the molecules more rapid. The convention depicts bonds drawn from top to bottom are in the dash conformation while the bonds drawn from left to right are in the wedge conformation. This easily, and quickly, indicates the stereochemistry without the cumbrous bold and dashed bonds, as shown to the right. Haworth projection: For cyclic molecules, chemists utilize the Haworth projection. The projection depicts the ring on an angle, half above the plane of the paper and halve behind the plane of the paper. This allows the substituents to be drawn in the plane of the paper. 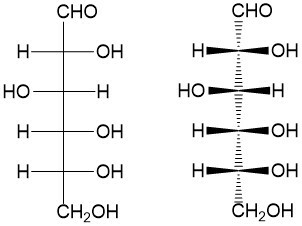 Take for instance glucose, shown below. The Haworth projection to the left is commonly drawn to depict whether the alcohol groups are above or below (alpha- and beta-, respectively) the plane of the ring. A more comprehensive drawing places the ring in a chair conformation, which will indicate whether the substituents are in the equatorial or axial. This allows one to determine the stereochemistry of each stereoisomer. Newman projection: Recall that even with three-dimensional configuration of atoms, there is free rotation about sp3 hybridized bond. 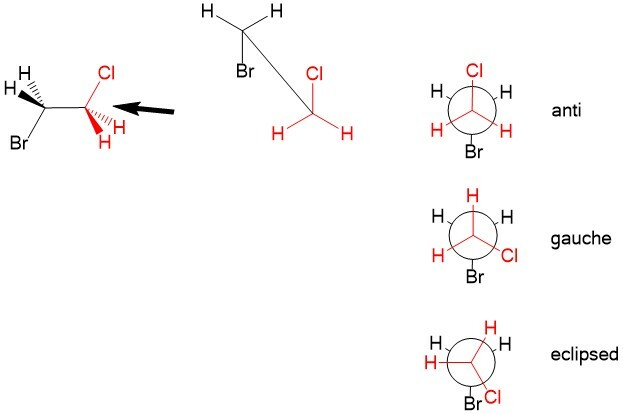 While it is customary to draw the structure in the lowest energy arrangement, we sometimes consider other rotations about a C-C bond that could affect reaction mechanisms. For this, we utilize the Newman projection. Looking “down the barrel” of the sp3 bond, we place carbon #1 substituents in the front (in red) and carbon #2 substituents in the back (black). The lowest energy conformation is to arrange the substituents of the two carbons in the ‘anti’ configuration, places Cl and Br opposite of each other. We can rotate one of the atoms such that steric hindrance of the halogen orbitals causes strain. It becomes higher in energy when at ‘gauche’, when the Cl and Br are not anti or in the highest energy ‘eclipsed’ configuration, when Cl and Br on top of each other. Temporary rotation of the bonds can be important considerations when studying reaction mechanism in the future!